Saturday, January 19. 2008 Convention (Pot-luck and) Planning Meeting. Are you thinking about going to Sandusky in August? It looks like there will be a crowd headed west around the great lakes from Mass-2! Saturday, February 9. Winter Pot-luck and Hayride. We had almost two doezen people show up for our winter potluck -- which was complete with ride schedules for 2008 AND plenty of food. Plus Mother Nature added her two cents with a snowy afternoon for our horse-drawn hay ride. Sunday, February 10. Northeast Motorcycle Expo in Boston . Eight of us were able to make the show. It was a busy place with a lot to look at. A ride on the subway across the city for luch at Mother Anna's was also in the cards. Visit www.kevmarv.com for more info on the show. Sunday, March 16. Americade Pot-luck Planning Meeting. We have a big crowd planning on going to Americade in June... and many of them showed up to Ed and Peg's to plan! So even though the snow was falling on Saturday, if we are talking about Americade can riding weather be too far away? Saturday, March 29. A Trip to Boston for a visit to the North End and Mother Anna's (and more). It was a cold and blustery day on our tour of Boston - but we still ahd 19 members join us for our day on the train. We visited the recently dedicated Firefighters' Memorial at the State House and enjoyed the tastes of our favorite Italian restaurant (Mother Anna's) … and then dessert at Mike's Pastries! Saturday, April 26. Spring Business Meeting and Dinner—with a skills practice. Had a fun time running over the tennis balls and practicing our skills together before our spring meeting. ...of course there was ice cream after lunch at the "99." Sunday, May 18. A “Steaming Cold” Ride. TheSteaming Tender in Palmer was a great find and a definate stop to put on out "try again" list! We even got some ice cream in at the UCONN Dairy before it started to rain -- even though we got wet before we were home! Saturday, May 24. Best of the Wurst Ride. Plans changed, and although we did not head to the Brautwurst Festival, it was a beautiful day for a ride. We headed to Wells and surprised a fishing Cliff and Marty before heading south for a stop at Hampton Beach. Week of June 1-8. Americade — Lake George , N.Y. It's sad to think that Americade is done for another year. We had 34 people at the Bay Front "compound" before the week was done. 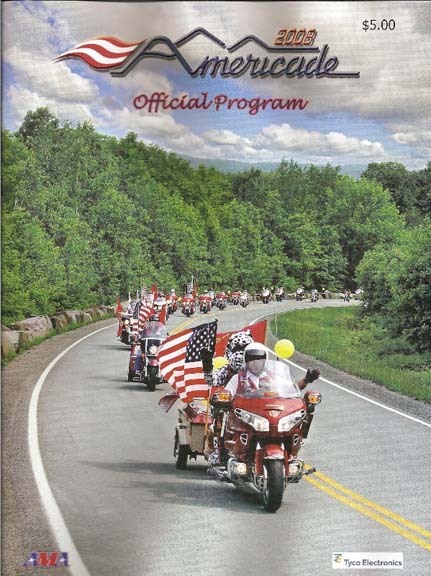 The Red Knights were featured on the Americade program cover this year! Lot's of pictures too. Saturday, June 21. Water and Fire Ride — We had a change of plans and direction and did not make it to either Wright's Chicken Farm or the Providence Water-Fire show. Instead we headed north into New Hampshire in search of twisty roads and ice cream. We found the former along Route 123 and the latter at the Walpole Creamery! Saturday, June 28. RK Vermont-2's Paul's Ride. It was a great Summer's day... and Vermont-2 had laid out a great route and fun scavenger hunt for their charity ride. Three of the five bikes from Mass-2 came home with door prizes! ...of course the ride home needed an ice cream ride too. Friday, July 4. 4th of July Pot-luck BBQ. We had 13 bikes (with our friends from the Patriot Guard and Rolling Thunder that led the 4th of July Parade in Petersham -- then we had 30 people at our BBQ! Lot's of food and lot's of fun. Saturday, July 5. Another parade... We had a dozen bikes show up to participate in the Ayer 4th of July Parade, then it was off for ice cream on the ride home! Saturday, July 12. Americade's Picture Perfect Pot-luck. Our pictures and videos from Americade brought a lot of laughs to accompany our evening festivities. (Fri. to Sun. ), July 18-20. A weekend on Route 100. We had a Vermont B&B (the Swiss Farm Inn) with GREAT food, wonderful hosts, friends from Vermont-2 and fun roads. Saturday, July 26. Play your cards with the Chapter. It was a great day with blue skies and eleven bikes! We ahd a lot of fun chasing the treasurer around southern New Hampshire to see who ended up with the best hand. (Shakey did). Saturday, August 2. A Chapter Porker Run. We ate , umm, rode, and ate some more then rode some more (you get the picture). Mother Nature was not completely cooperative as we only made three of our five scheduled "nourishment" stops before it started thundering around us! But now we have a mission to get to the stops (for nourishment) that we missed! Saturday, August 9. Day ride to Wells, Maine to visit our snow birds. We ended up with about a dozen visitors to Wells -- some on Friday, some on Saturday, some on Sunday... and a few on four wheels too. Those arriving after dark on Friday were a little damp too! Our planned stop at the UNH Dairy was off the books as the building is closed for the summer for renovations... but I know there was a few who stopped at the nearby winery! (Thurs. to Sun.) August 20-24. Red Knights' International 2008 convention Sponsored by the RK Ohio Association in Sandusky , Ohio. Departure date was met with blue skies and sunshine for the ten bikes that headed to Ohio! Sunday, August 31. Labor Day Weekend Cookout. What a great day for our BBQ at the Tully Lake Recreational Area in Royalston. A few of us met up for a pre-luncheon ride and then it was off for a bunch of great food and an afternoon of laughs with our friends. September 4-7. Killington Classic in Killington , VT. Hurricane Hannah kept a lot of people away from the Classic this year. But there were still about 800 bikes in the parade and more riding through the mountains enjoying the roads of Vermont. Saturday, September 27. Lunch with the Clydesdales. RAINED OUT! Sunday, October 5: Breakfast with Smokey Bear… It may have been only 34 degrees but we had 13 bikes meet up for a great breakfast at the Jaffrey FD and a foliage ride afterward! Sunday, October 12: Annual Chapter meeting and Apple Pie Ride. What a great day! The weather and the foliage was OUTSTANDING for our ride to Dummerston for the Vermont Apple Pie Festival. (Here's an article about our ride to Jaffrey and the Apple Pie Festival that was in Backroads Magazine a while ago). Then we put on about 200 miles out to Route 100 and then down through the valley by hte Hoosick Tunnel and the Mohawk Trail. Lot's of other riders were out too!. Saturday, October 18. Breakfast Club & Mystery Ride. Our first Saturday Breakfast Club for the Fall found morning temperatures in the 20's! But we still had seven bikes and made a stop at the Hardwick Vineyards during our travels. Saturday, October 25. Our Halloween Costume Party & Pot Luck has been cancelled - Instead we will be celebrating in Ashburnham with a parade and festivities dedicating thier new Fire Station. Contact VP Kevin Martin if you are looking for more info. Sunday, November 2. Polar Bear Ride. Our ride lived up to its name, but we still had 15 bikes and 21 people join us before the day was over dispite the 30 degree temperatures! Sunday, December 14. Red Knights Christmas Party and Yankee Swap. Even the ice storm, downed wires and trees, and extensive power outages could not keep us away! Wednesday, December 31. Happy New Year! It was cold cold cold (and snowy) for our New Year's Eve Card and Game Party at Moe and Marcia's. We had a lot of fun... and a "bit" of food to share too! Each weekend in February is a continuation of the Lake George, NY Winter Carnival. Presidents Day weekend's schedule includes motorcycle races on the ice and Saturday evening fireworks! A handful of bikes enjoyed 200 miles under blue skies and warm sunshine with a lunch stop at Chef Wayne's Big Mamou retaurant in Williamsburg. Visit the RK-SC-1 web site for more info from the hosts of the Dixie Rally. 61 Joslyn Road , Hardwick , Mass. The RKMC will have an information booth at the Fire Chief‘s Show. If you hear of other rides… or just have free time and want to go for a ride — let others know — there's always someone who will be able to go! A perfect summer's day brought out nearly 200 riders who donated over $69,000 to the PBTFUS. Our friends in RK Ontario-7 asked us to spread the word about their Memorial Ride and Chicken lunch to be held on July 6. Thinking about planning that motoryclce trip you have always dreamed of? Here is a two part article that appeared in Wingworld with some thoughts on planning for your trip. 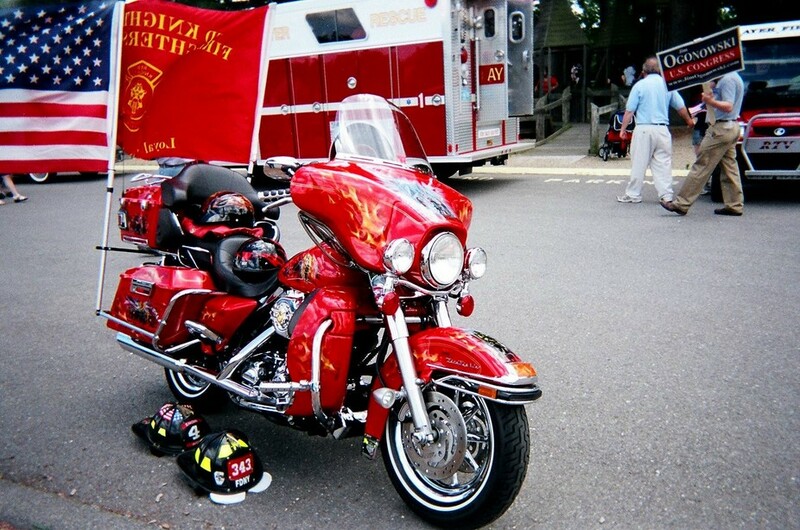 Is your club planning a charity motorcycle ride? Here are some thoughts that we have gathered over the years that may help you in your planning! Thanks to our friends at the On-site Academy for their hospitality at our rainy evening Ice Cream Social! February 16, March 15, April 19, October 18 (9:00 a.m. with a Fall Ride to Follow), November 15, and December 20. Motorcycle Night at Heritage Farm.